The Washington Post series, “Mission: Unimaginable,” by Steve Hendrix, featured on page 1 of the “Style section, September 9 and September 15, 2011, speaks to the Major Heather Penney story, a very personal account of events on the morning of September 11, 2001. Major Penney was wingman for the Caps flight, the first Andrews fighters airborne with verbal “weapons free” shootdown authority, an authority the Langley fighters already in a combat air patrol over the nation’s capital did not have. The emergence of Penney’s story resurfaced with it the complicated story about the national level response that day. Commission Staff determined that the Andrews fighters were not involved in the actual defense that morning. By the time any Andrews fighter was airborne the attack was over. Nevertheless, the fighter wing at Andrews perceived that it had been involved and their story reemerged in 2008 with the publication of Touching History by Lynn Spencer. Now, the story has reemerged a second time in the Washington Post articles. The story was, and still remains complex and poorly understood. Writers such as Summers and Swan, The Eleventh Day, have detailed the complexity of the day and aftermath, the story of which remains unfinished. Before them, Creed and Newman, Firefight, Inside the Battle to Save the Pentagon on 9/11, touched on the Andrews Air Force Base story. The Air Force, itself, published an accounting of the Air Force story, Air War Over America, in 2004. Lynn Spencer provided additional insight into the United States Air Force response, including the Andrews story. The collective literature of 9/11, including the authors mentioned, has not yet provided a theoretical construct to place stories such as Major Penney’s in context. One way, therefore, to tell the Andrews story is to provide an overarching thesis, a construct that is grounded in theory. I have chosen chaos theory. That theory provides a language suited to the events of the day and the aftermath, a language that enlightens in a way not possible otherwise. The one word used ubiquitously on the day of 9/11 and in the telling in the aftermath is “chaos.” The word is never defined; it is simply used to describe events in a way that allows one to understand that which cannot be otherwise understood. Given that ubiquity, it is a logical extension to apply the theory, itself. The Andrews story is inextricably tied to the story of United 93, the one plane that the air defenders could have had a chance to do something about, and which the Andrews expeditionary force, pressed into an air defense role, thought they could do something about. Summers and Swan, in their discussion of United 93 wrote, “Far below, all was chaos. At the very moment that the attendant in 93’s cockpit had fallen ominously silent…Flight 77 had slammed into the Pentagon.” In that passage, Summers and Swan linked together the two hijacked planes that would confound those who attempted to set the record straight concerning the attack on the nation’s capital. During testimony on May 22 and 23, 2003, FAA Administrator, Jane Garvey could not, Transportation Secretary Mineta could not, and the NORAD delegation that followed them could not set the record straight. The two prongs of the southern axis of a two-axis attack became the story that could not and would not be told accurately. “All was chaos,” at the time, in the aftermath and even today. Major Heather Penney took to the sky with orders to “bring down United Flight 93.” But that is not what transpired once the Andrews fighters took to the air and discovered the reality of the situation. The fact that Penney’s memories, as told by Hendrix, don’t line up with the chronology of events is a reflection of the chaos of the morning and the misinformation that may have been available to her, then or since. It does not constitute a judgement that Penney was anything but a heroine for her actions that morning. She was heroic. I have written about chaos theory in other articles. Here, a brief summary is in order. It is understood in the literature that the mathematics and science of chaos theory cannot be rigorously applied to an event such as 9/11. The literature does allow, however, the use of chaos theory metaphorically. Further, the language of chaos theory is useful to describe and correlate events in some sensible manner. Specifically, I use four terms from chaos theory: strange attractors; non-linearity, cascading bifurcation, and disruptive feedback. Strange Attractors. There are at least two pair of strange attractors that emerged from 9-11, both predicable in retrospect, but their dominant role could not be and was not predicted. One pair, the Northeast Air Defense Sector and the FAA’s Boston Center, is not germane to this article. The other pair, the Secret Service and Andrews Air Force Base, is. Nonlinearity. Chaos is nonlinear, most of the responses to the attack, especially at the national level, were linear; by rote, SOP, or TTP (tactics, techniques and procedures). The Secret Service rote response was to protect the President, the Vice President, and the White House. To do that it reached to the assets it knew, the air wing at Andrews. The Service did not pick up the phone and call the National Military Command Center. Cascading bifurcation. The attack itself was a double bifurcation, a two-axis attack each axis with two prongs. Any student at any of the senior military schools can draw arrows depicting such an attack. However, the situational awareness of the attack continued to bifurcate far beyond the simple military elegance of the attack. The saga of United 93, the most vulnerable of the four hijacked aircraft, became unmanageable. Even though Cleveland Center provided clear and explicit reporting in near real-time all the way to FAA headquarters, that clarity became myopic almost immediately. The flight was confused with Delta 1989 and was thought at one point to have landed in Cleveland. Once Cleveland changed the UA 93 flight plan to assist Washington Center, that change confused non-air traffic control observers who watched the “track” continue towards Washington on a traffic situation display, similar in every respect to the flight tracker that the general public uses to follow commercial airplanes of specific interest. That “track” faded at 1028 when the notional United 93 “landed” at Reagan National. Even the impact of United 93 bifurcated into two reports, one accurate, one false. The false report that it crashed at Camp David came from the Secret Service, the very organization that was providing information to the Andrews unit. Disruptive feedback becomes, literally, white noise to anyone who has had an amplifier or other audio device go haywire. Two major disruptive events of the day were the false report that AA 11 was still airborne and the understandable but inaccurate report that Delta 1989 was hijacked. However, there was a third disruptive event the one we just discussed and the one that concerns us here, the fact that United 93 was perceived to be rapidly approaching the nation’s capital. 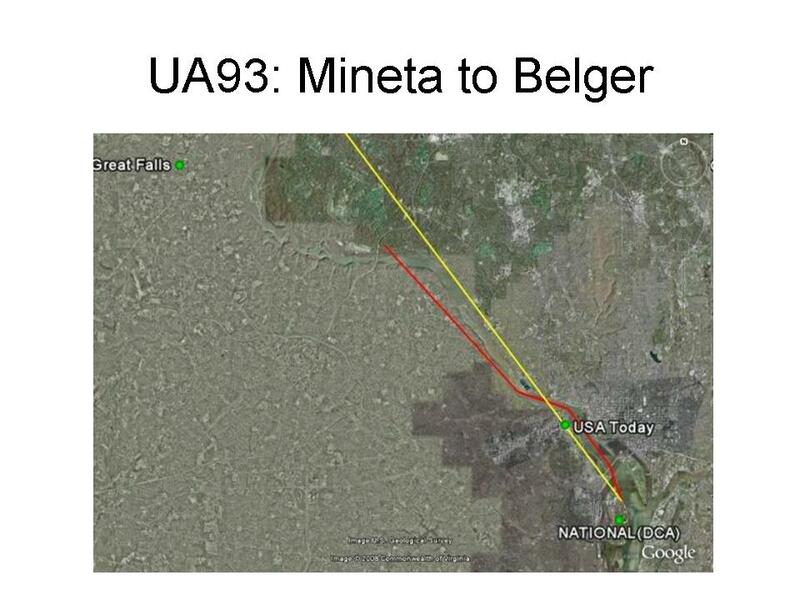 Despite explicit information from Cleveland Center that United 93 was down, Monte Belger provided specific data points to Secretary Mineta, then in the PEOC, concerning the approach of United 93. 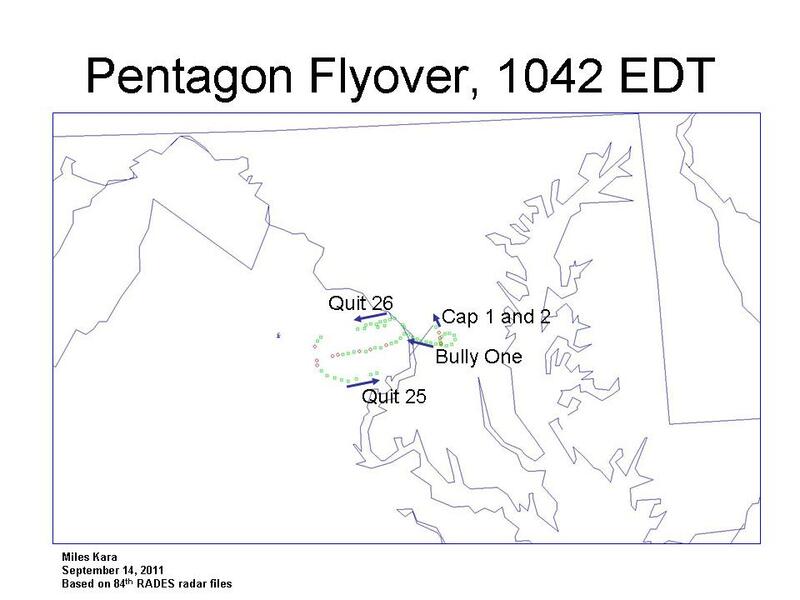 Here is the ground trace of the Hagerstown to Reagan National flight plan entered by Cleveland Center. The graphics were created by Brian Stark (Boone870 on the web). Here is a YouTube link to Brian Stark’s assessment, including some audio. Here is a YouTube link to Stark’s post on the UA 93 flight plan change, at the controller level. All of that primary source information establishes that the perceived flight of UA 93 was being followed on a Traffic Situation Display (TSD), was apparently noticed near Dulles, and was lost. By 1028 UA 93 was both known down, actually, and known lost, notionally, as a TSD track by air traffic control. “The four data points: Great Falls, USA Today building, down river approach (red), and National Airport are taken from a 2002 MSNBC interview with Transportation Secretary, Norman Mineta. Even though Belger said he was watching radar he had no access to an air traffic control scope. The one thing he could watch was a TSD. Mineta was in the PEOC (President’s Emergency Operations Center) at the time. This threat, even though notional, was the likely threat passed by the Secret Service to General Wherley at Andrews and thereafter to the Andrews pilots. At that time, 1028, the Secret Service first made sure they were in contact with Quit 25, the Langley lead pilot, via National TRACON on the DCA approach frequency. Quit 25 changed frequency to allow that. Once Quit 25 came up on frequency the DCA controller broke off, most likely to talk to the Secret Service. The DCA controller was careful to document the presence of three Langley fighters and the absence of a target. As a result the Secret Service had clear and explicit knowledge that three air defense fighters, two fully armed, were in a combat air patrol over the National Capital Authority with no actionable target. Yet the Service still pressed Andrews to launch. Why? The one reason that makes sense is that the Secret Service could pass shootdown authority to the Andrews fighters over whom they had some control. That was not possible with the Langley fighters without going through the Department of Defense. Here, in the voices of the day, is how events transpired. There is no mention of United flight 93, but Andrews Air Force Base was taking things seriously. We pick up the story with one of a series of broadcasts on frequency warning any aircraft listening to Andrews to stay out of Class Bravo airspace or be shot down. That example of broadcasts that began at 1005 is followed by the launch of Bully One (Hutchison) followed by Caps 1 and 2 (Sasseville and Penney). Bully One has just returning from a training flight to a range in North Carolina. Both flights soon learned, once in the air and away from the misinformation flowing from the Secret Service to Andrews, the real story. 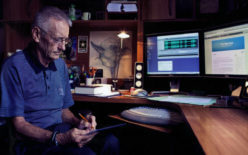 Each audio clip is partially transcripted. Swan: [indistinct] Quit 25 come over to you, did he come over? Krant: We’re talking to him now, thanks. Second, the presence of the Langley fighters in the area was known. Third, there were unknown tracks to the northwest and at least one helicopter had been given approval to return to base, a southerly route from north of Dulles airport to Davison Airfield at Fort Belvoir. Krant: Bully One, you taking off as a flight of two or just a single? These clips establish that Bully One, on landing, understood he was to get armed and refueled, but not to go back up in the air. That plan was superseded at about 1036 by orders from General Wherley to get back up in the air immediately. The immediacy of that order is likely the combined result of the Belger-Mineta conversation about 93 and the Secret Service Joint Operations Center direct contact with DCA and learning about the unknowns up river. Based on the consistent story told by Andrews pilots, the predominant cause of the order was the perceived approach of United 93. Krant: Bully One, the airspace belongs to the military for the operation right now, I showed several helicopters northwest of the airport if you’d like to perhaps [indistinct] south of the airport and go up towards Gerogetown, I don’t see anything else right now. Krant: Bully One proceed where ever you need to go. Like I say, that information probably came through your source not ours. The FAA was no longer able to track the precise location of the plane; somehow it seemed to have slipped beneath radar coverage. But based on its last known position, heading, and airspeed, the FAA was estimating the time until it reached Washington…[FBI Agent] Rice had been giving [FBI Agent] Combs updates every five minutes…Then Rice broke the pattern. ‘Chris you got four minutes,’ he said somberly….T-minus-zero came and went…[then] in the distance there was a buzz..it was the unmistakable roar of a jet engine winding up…Then an Air Force F-16 zoomed low and fast over the courtyard…On Washington Boulevard, frustration was suddenly transformed into jubilation. When the F-16 flew over, it appeared to dip its wing, as if signaling to the people on the ground that the cavalry had arrived. The picture of Hutchison’s flyover became iconic and the story is a good one, except that Hutchison was not the cavalry. Not quite 45 minutes earlier, the Langley fighters arrived and set up an east-west combat air patrol protecting the nation’s capital. In fact, a couple minutes prior to Hutchison’s 1042 flyover the Langley wingman, Quit, 26 was at 23000 feet over the Pentagon, unseen by those below. To the east, one minute prior, Caps One and Two, Major Sasseville and Captain Penney, took off from Andrews. So, at the moment the Sasseville/Penney flight began its quest for UA 93, according to the Post article, there were a total of six fighters in the sky over Washington D.C.: three air defense fighters with weapons, authentication tables, and no delegated authority; and three expeditionary force fighters with no weapons, no authentication tables, and delegated oral “weapons free” authority. The narrative continues in the words of Creed/Newman. 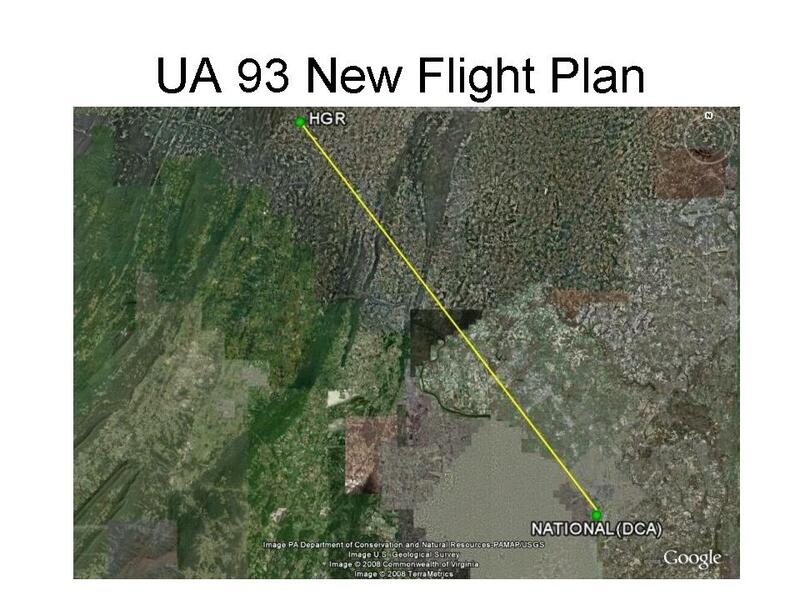 The “Camp David” report was accurate as to the fate of UA 93, but wrong on the location. More important, Reagan National TRACON and FAA’s Washington Center, the controllers for the Sasseville/Penney flight knew that there was no further air threat. Hutchison was near his maximum altitude he would fly that morning, “three point five” (3500 feet). He descended and flew over the Pentagon at 600 feet, turned left and climbed back to his maximum altitude and then descended and landed at Andrews. We pick up the real time audio with the arrival of the Caps flight on the scene and the concurrent return to base by Bully One. Swan: You talking to that four six six five code, south of the airport about.. Caps One. I’m out of Andrews with two fighters. Krant: Caps one, roger, fly direct to an orbit about 10 miles to the northwest of Washington at six thousand, what’s good for you eleven thousand? Sasseville and Penney, however, continued their mission. And the radar does show, in fact, that on their first leg they did go north, “up river,” for about three minutes, something Hutchison before them did not do. 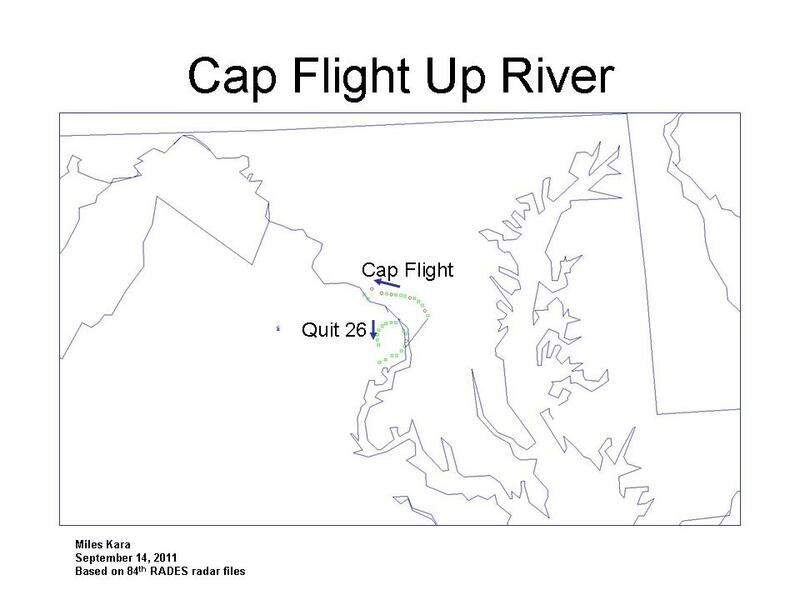 Here is a graphic depicting the spatial relationship between the Cap flight and Quit 26. At the moment the Cap flight turned back, Quit 26 was due south a few miles. That relationship is important as we pick up the story at the Northeast Air Defense Sector. At 1043, Bully One was landing and Caps One, Sasseville, had learned, as did Hutchison before him, there was no target, as both were told. Sasseville deferred to an air traffic control request to hold at eleven thousand feet. As the Caps flight flew back southeasterly in their holding pattern they came to the attention of the very busy military controllers at NEADS. Eventually, training and professionalism took over and the CAP over the nation’s capital sorted itself out. After 11:15 EST, once a fully armed pair of Andrews fighters finally got airborne, the CAP was complete, responsibilities were allocated and all fighters were on the same frequency. We first learn of the final CAP configuration at 1046 when Wild One (Major “Raisin” Caine) advised Andrews Tower of his impending takeoff in five minutes. It would be a full armed pair of fighters with “weapons free” authority. In that same conversation we learn that Bully One was to be armed. 1046 Wild One status report. The Wild flight did not take off until 11:07 EDT, despite Wild One’s five minute estimate. This is an example of the fact that it took time, measurable time, for each aspect of the nation’s reaction time that morning. In this instance the estimated departure time was 1051 EDT. The actual time was 16 minutes later. Major Caine ultimately established CAP discipline and got things organized, but not without a hiccup. The Langley fighters, not knowing who the Andrews fighters were, “spiked” (illuminated with a target acquisition radar) one of the Andrews fighters as the Langley fighters were completing refueling. This next audio clip contains that vignette and also provides some insight into CAP defensive measures. Tankers were present and acknowledged, but Caps 1 cautioned Wild 1 about a ‘bait and switch’ danger. Once the Andrews fighters became airborne they quickly found they had no search mission. The battle was over and National TRACON had no targets for them. Ultimately, they had to organize an efficient combat air patrol over the nation’s capital integrating 7 fighters with disparate armament, rules of engagement, and command and control. Major Caine, Wild 2, forcefully and persuasively got all parties in sync. That was a job well done, thanks in large part to the key role played by the air traffic controller at National TRACON. That was the Andrews story; it got lost in the telling. Major Heather Penney played an integral part in bringing order out of chaos. In conclusion, we hear her voice calmly going about her mission. Previous Previous post: 9-11: United Flight 175; Transpoder Code 3321, an interesting anomaly.